Made with Love 4 ATL & facilitated by The Pillyr Foundation. Coming soon. Designed to fit your mobile device for a better user experience. All proposed campaigns are within our city and possibly in your neighborhood! Link your campaign with your Google Analytics acccount to gain insights of user activity on your project page. We use Stripe to process donations. They are a Level 1 PCI Service Provider with AES-256 encryption to protect transactions. The freedom is yours to make a donation without signing up for an account. You can even do it anonymously! Creators can accept campaign donations directly on their own website by adding just a few lines of code. A robust resource that can answer most questions about potential projects within the Atlanta city limits. Our project managers will facilitate creators as liaisons with vendors, neighborhoods, and local government agencies. The Pillyr Foundation, Inc. is a 501(c)(3) nonprofit organization in the State of Georgia. Donations that support our mission are tax deductible. Made with love in ATL. © 2019 The Pillyr Foundation, Inc. All Rights Reserved. 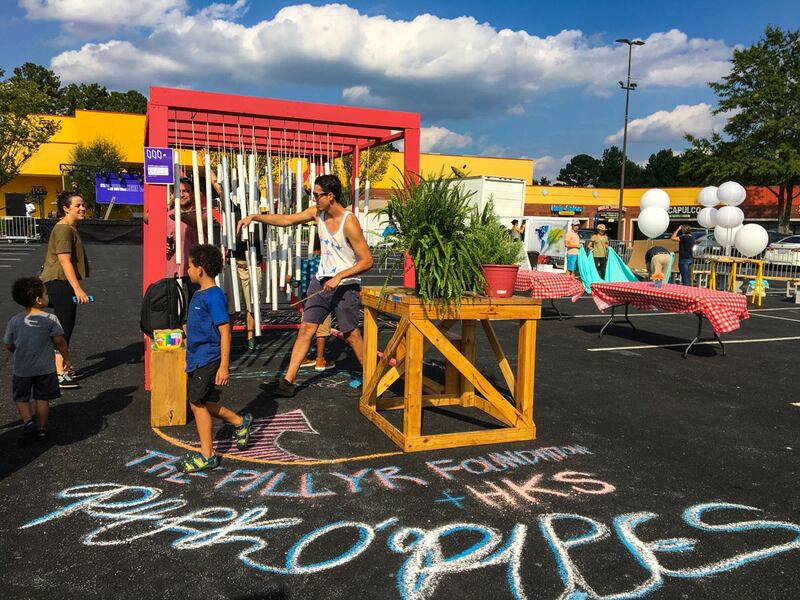 On June 11th of 2017, The Pillyr Foundation joined Atlanta Streets Alive's Westside route as an activity partner with our first tactical urbanism intervention, dubbed Operation Pit Stop. 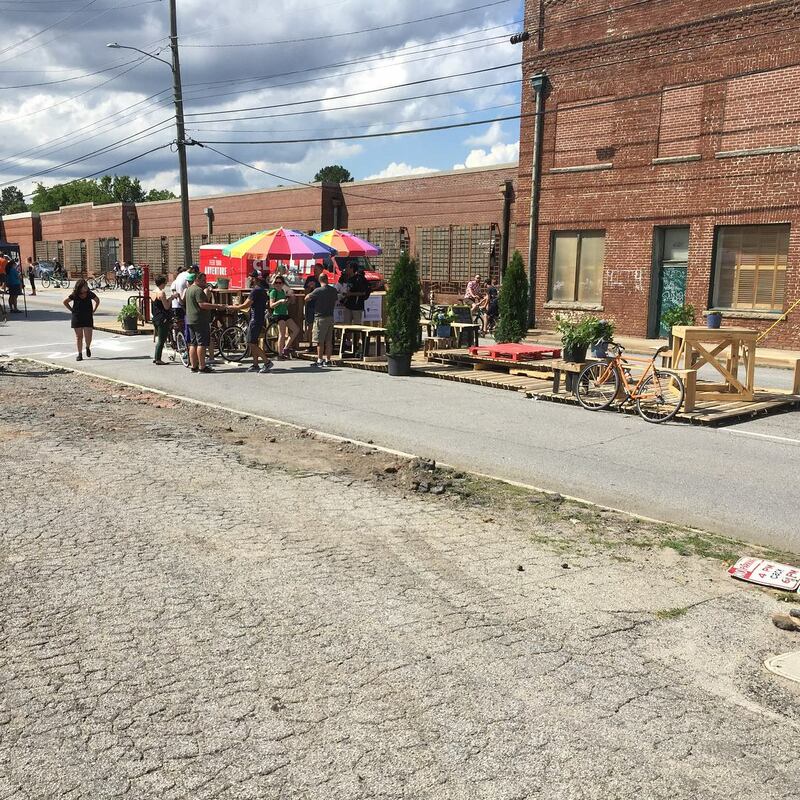 At a length of 50ft, this pop-up project activated an industrial corridor along Marietta St NW with public space. 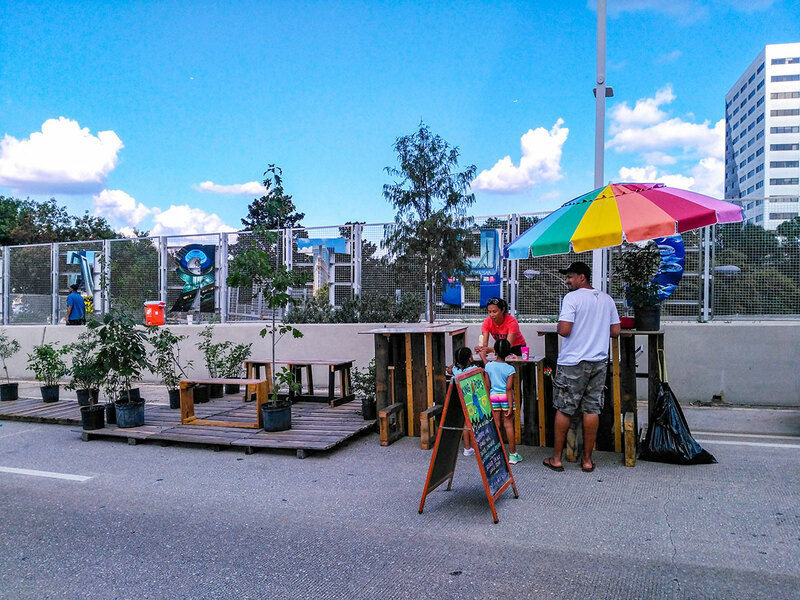 The build included deck space, a standing bar, a variety of seats and benches, a small performance stage (activated by spoken word artists), trees and plants that brought life and color to the site, and finally the Pillyr "Bike Bar", which is designed for cyclists to dock and enjoy refreshments from the comfort of their saddle. King of Pops was joined us to run the bar. A final addition to the project was a temporary, artistic crosswalk that provided the public a canvas to add their own art to the street. The location was selected due to the lack of crosswalks, public space, and due to vehicular traffic treating this city road like a freeway. Check out our facebook event to see more photos from the project! 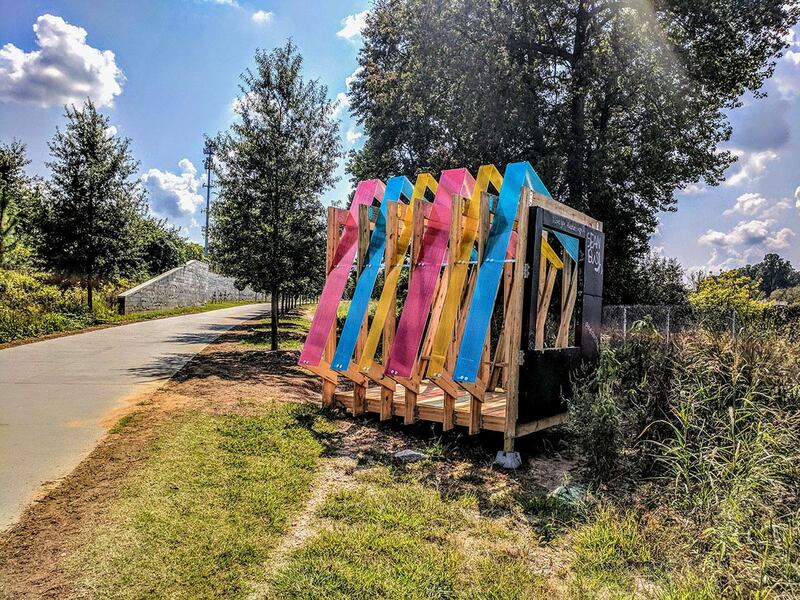 Designed by friends Tenay Gonül and Julian Quinn, City Dreamers is a pavilion and Art on the Atlanta Beltline commission on the Eastside Trail located near Midtown Arts Cinema. The Pillyr Foundation was brought in to facilitate its construction and provide on-site consulting to upgrade the project's structural stability and safety for the visiting public. 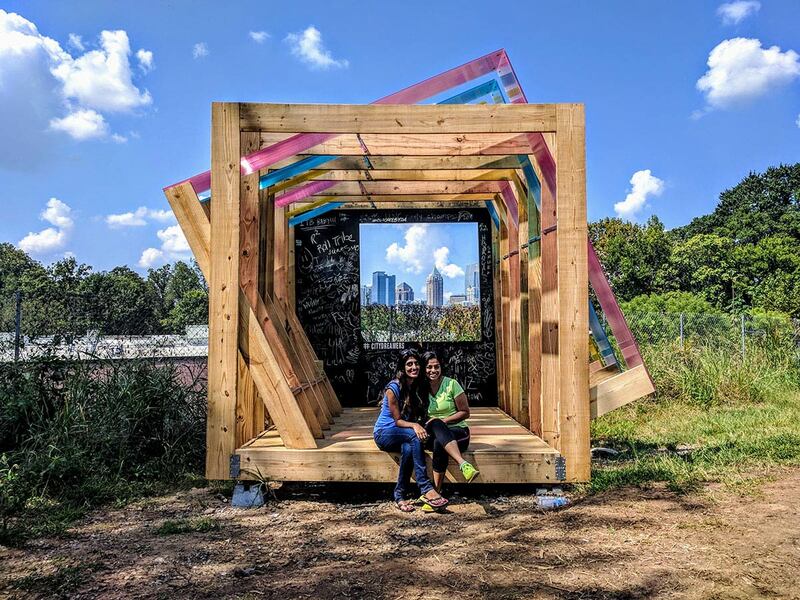 In a big and fast city like Atlanta, the City Dreamers spot is a serene and happy place to be to view the city from another window. Being in the cube gives a feeling of isolation from the rest and slows the perception of the city down to enjoy and appreciate what is there. Nobody has to do much more. Just be there to view, to think, to sit and relax. The picture window on a plain black plane limits the rest of the scene by focusing a frame of view in one’s mind. This black plane is actually chalkboard where users can express themselves about what they see, feel or want to share. It creates an interactive message board to share experiences with strangers and friends. 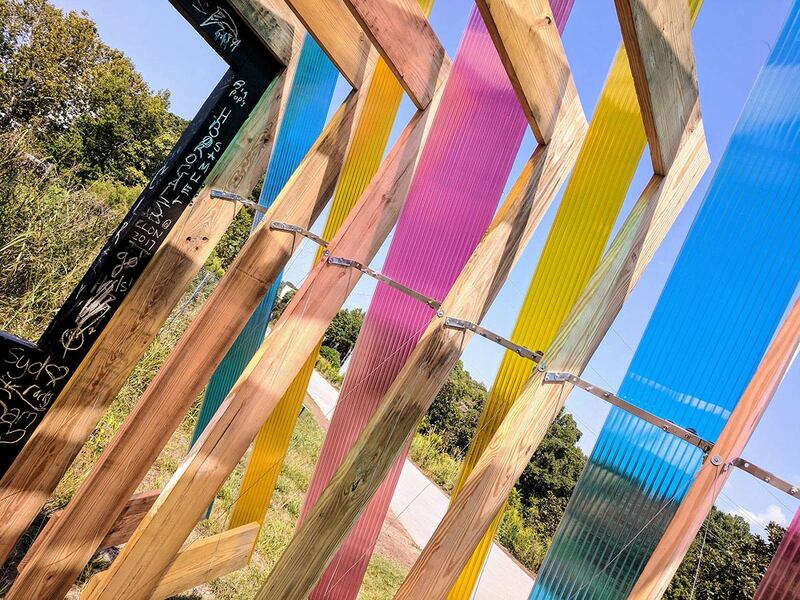 The colorful pieces of plexiglass in rotation with the rest of the structure symbolizes a twist in linear thinking. The combination of colors and rotation implies alternate modes of thought and living as a possibility. 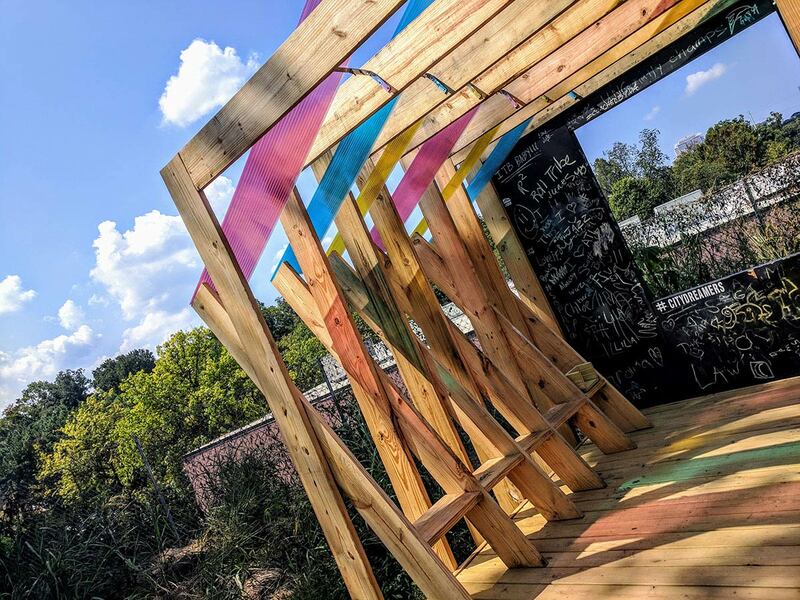 City Dreamers is an artistic place seeking to render a colorful viewpoint for the city, a unique piece of urban furniture, a shaded place to rest, a place to share an idea, a point of interest, and an added reason to move along the Atlanta Beltline. 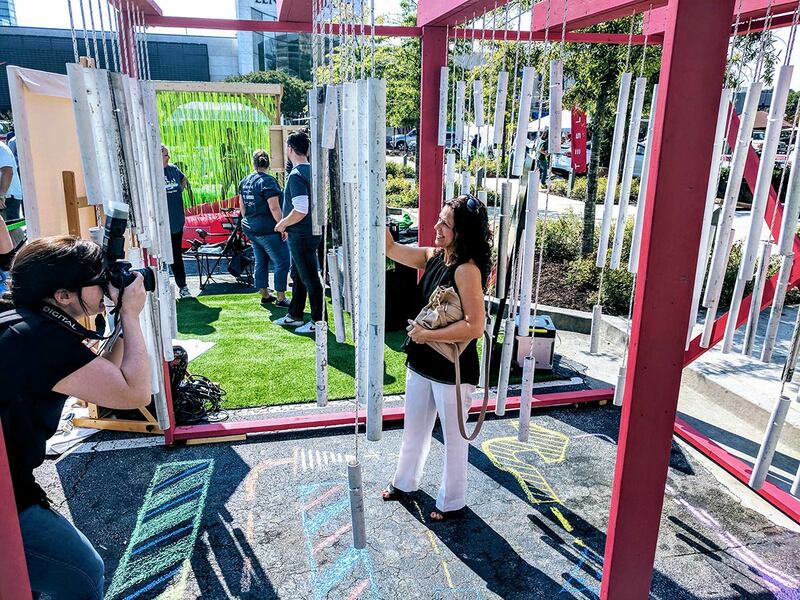 Park O' Pipes was created for Park(ing) Day 2017 with the intention of quick deployment at all the various events attended between September 15th and 16th. HKS Architects provided support for this project. 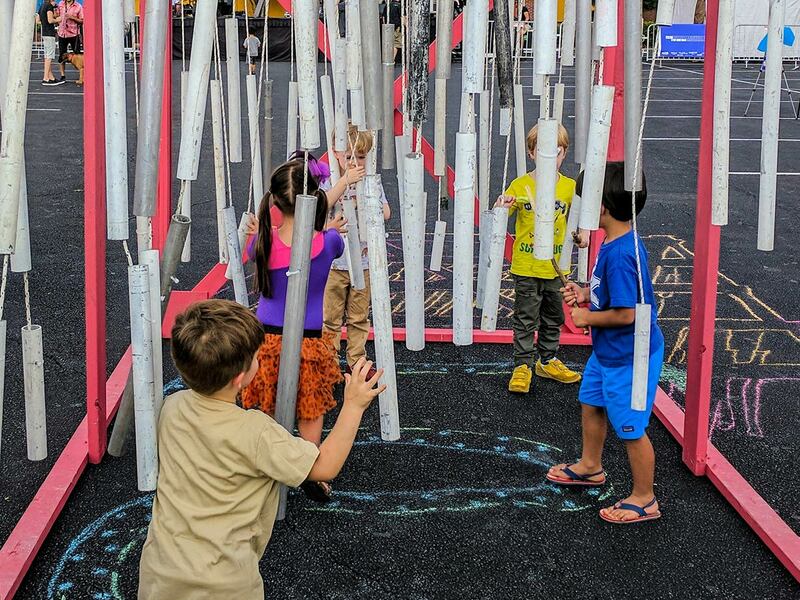 This tactical urbanism intervention challenged the lack of urban play available for all ages so we tasked ourselves to create an interactive installation that would stimulate various senses at the same time. 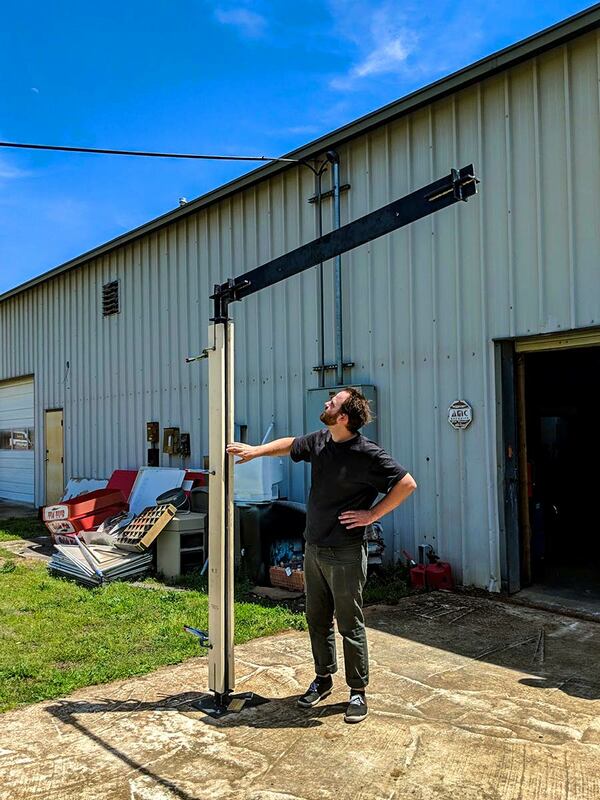 After getting access to a large quantity of aluminum pipe, we pursued turning this material into wind chimes and learned the mathematics to tune each length of pipe so that we could establish a range of sound. 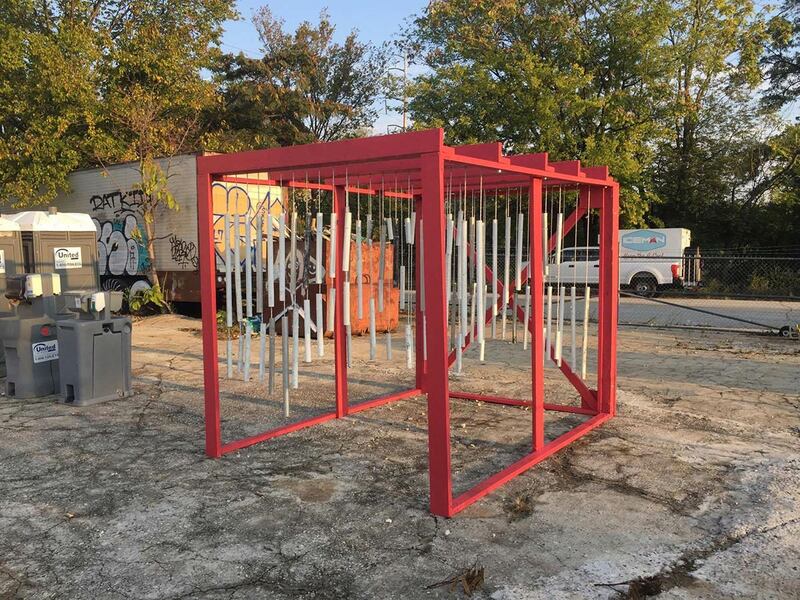 A wood frame box was created to act as a chamber for the 5 rows of wind chimes, and in plan those rows would establish a path of circulation so that one could absorb a sonic spatial experience as they meander through it. An added benefit of this project was witnessing both children and adults interacting with the installation. 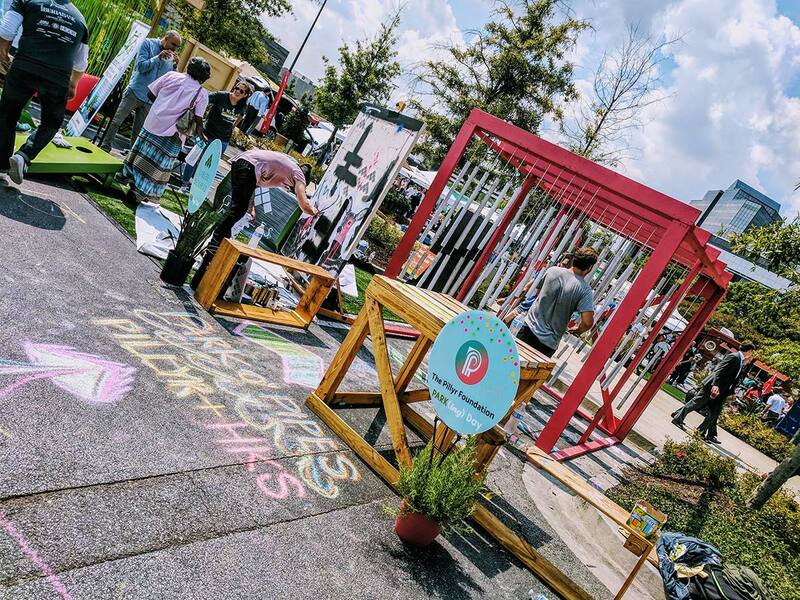 Park O' Pipes was awarded "Most Interactive Installation" by attendees of the Livable Buckhead Park(ing) Day event. 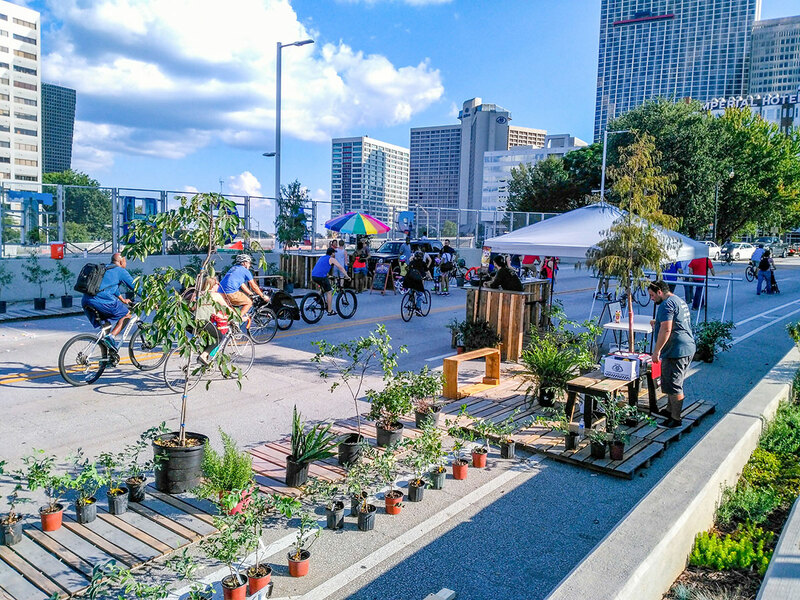 On September 24th, The Pillyr Foundation took over the Peachtree Street bridge overpass connecting Midtown and Downtown to extend the city's public space and canopy for Atlanta Streets Alive. 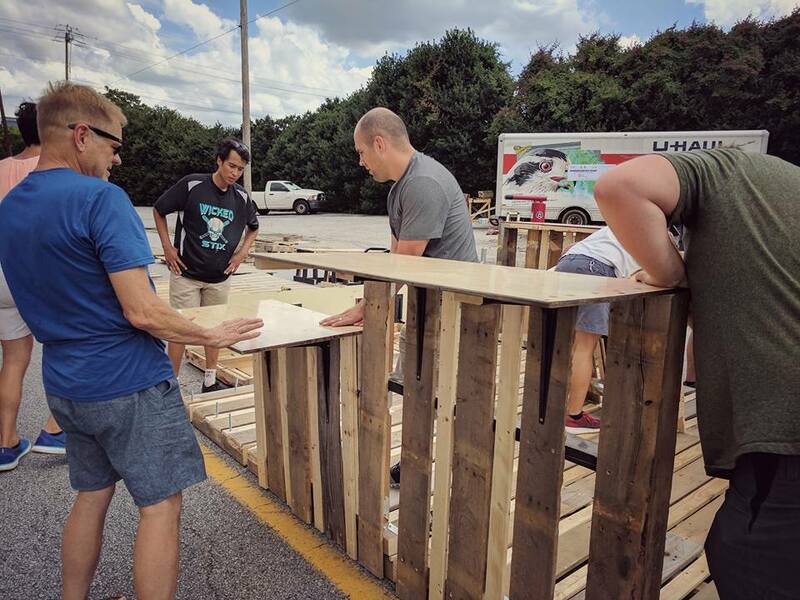 We delivered over thirty plants and trees, deployed our Park O' Pipes wind chime installation, set up a dozen wood pallet deck surfaces to establish a boardwalk and seating areas, and redeployed our Pillyr Bike Bar in a split configuration so that we could accommodate King of Pops and Cafe + Velo as activation partners. 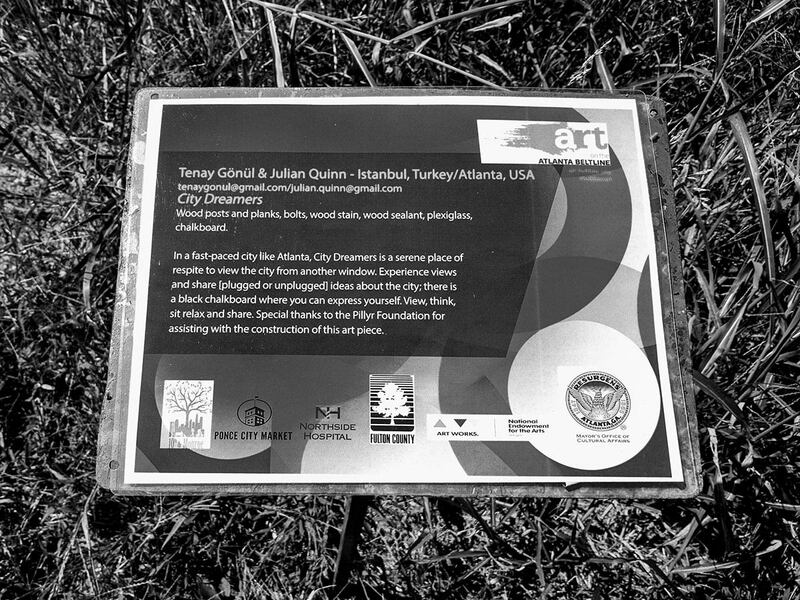 Trees Atlanta also attended the project to advocate for the city's canopy and register volunteers for its fall planting season. 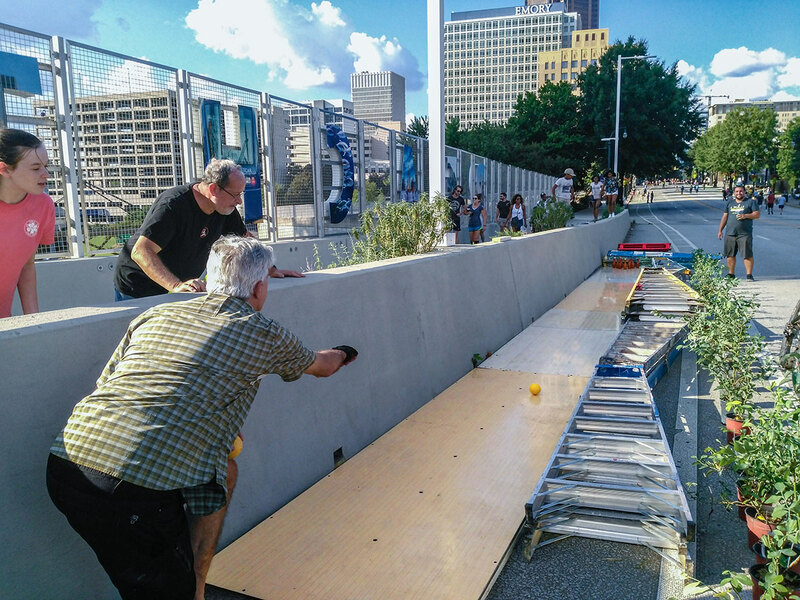 As an added bonus to the public, we assembled stacked ladders as sidewalls and bowling lane flooring reclaimed from Midtown Bowl to create a pop-up bowling lane. Privacy screens used at construction sites were utilized to provide shade at the Park O'Pipes installation. 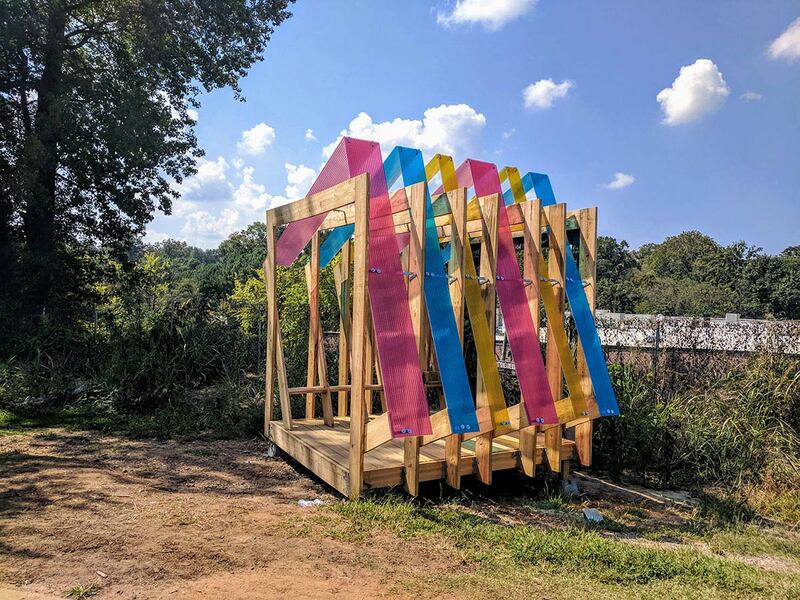 We would like to thank all volunteers for their time and our activation partners Trees Atlanta, HKS Architects, Brasfield & Gorrie, and Atlanta Community Toolbank for providing material support to bring this activation to life. 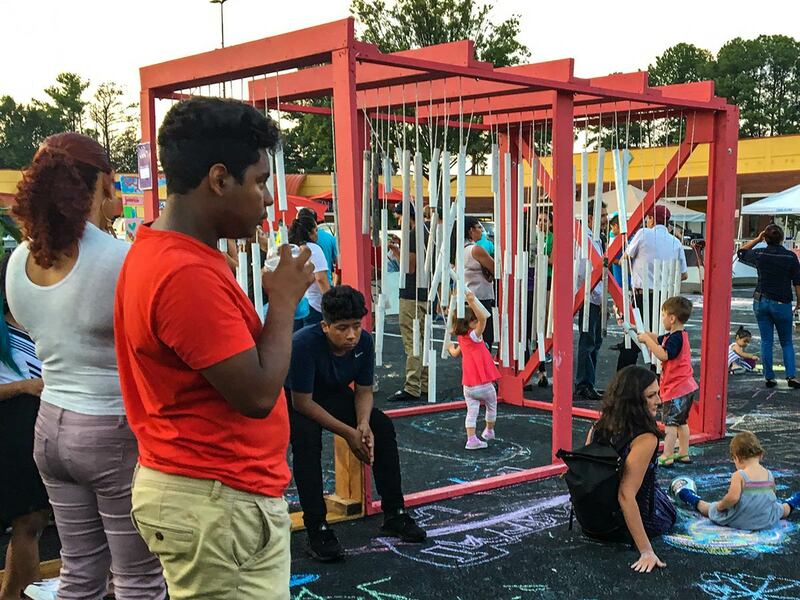 In 2018, the City of Atlanta's Department of Planning (DCP) announced the Placemaking Program, which empowers communities to reshape public spaces to enhance their overall physical, cultural and social identities. 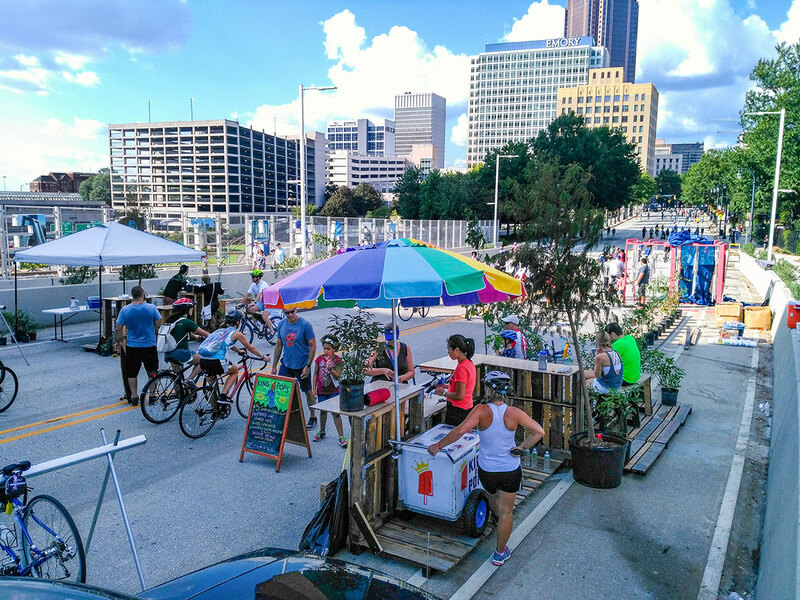 DCP's Office of Mobility Planning is leading the Placemaking program. 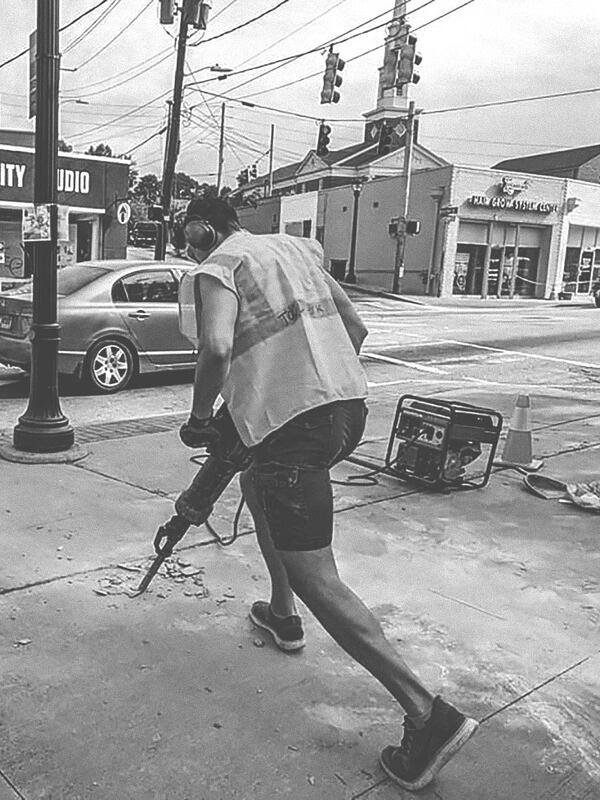 The overarching goals of this program are to improve street safety and to transform streets into vibrant, attractive places that benefit the community and businesses alike. To support the launch, The Pillyr Foundation was brought in to deliver one of two pilot projects to test our the process of the program. 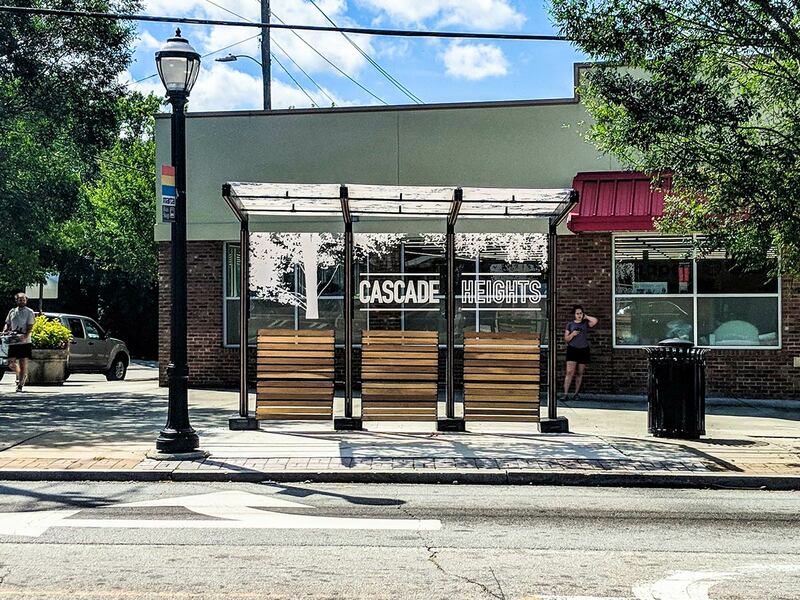 We were selected to work on mobility needs for Cascade Heights through a partnership with Atlanta City Studio. 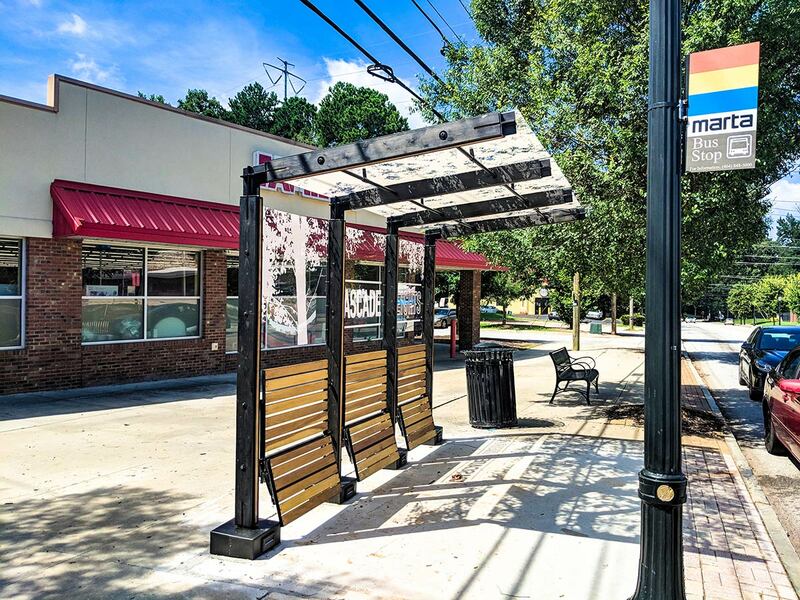 The result of our collaboration was a custom designed bus stop shelter at the intersection of Cascade & Beecher. 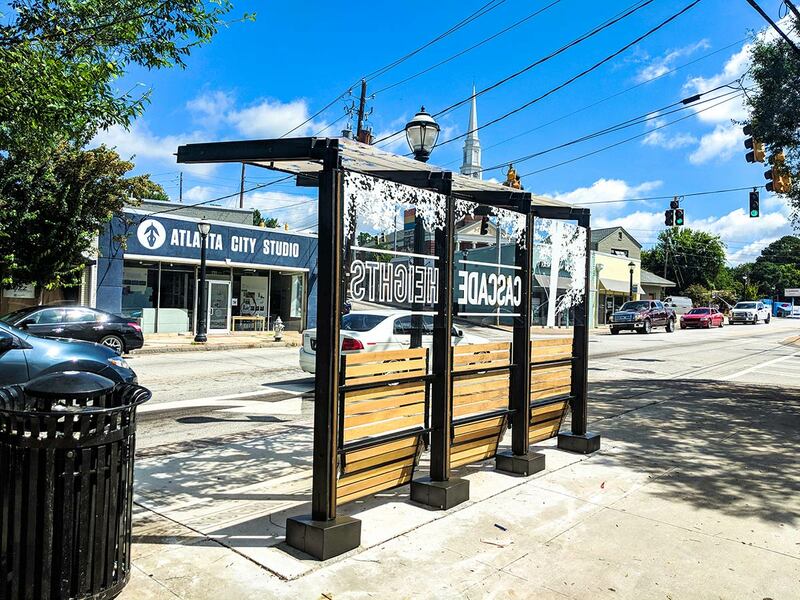 This project would provide Atlanta residents that use MARTA bus 71 with some shelter from the elements, and take advantage of available space at this intersection to demonstrate how design can stimulate activity in the neighborhood's public space. 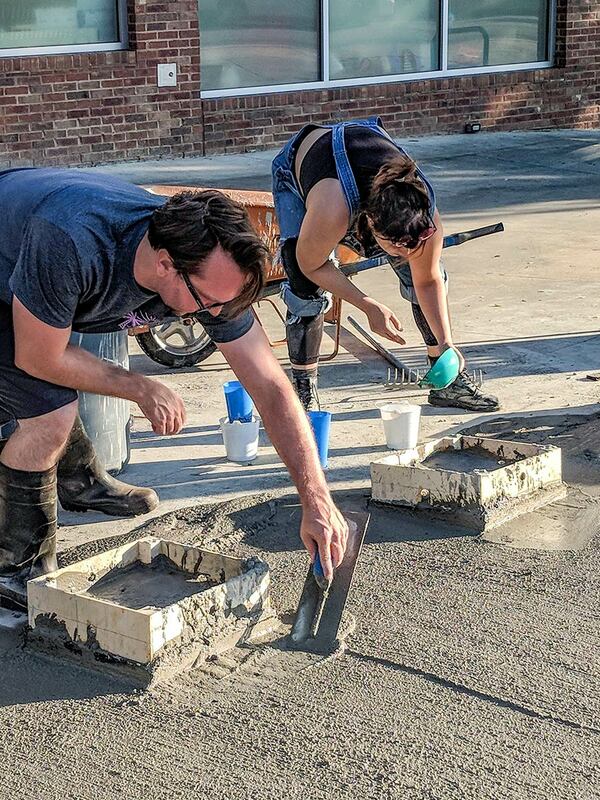 After the completion of several community engagement meetings, three distinct options were developed with residents and the city deciding on the design that was installed during the summer. The structure is welded steel columns working as flitch beams with painted pine board on either side of the steel giving it its rigidness. 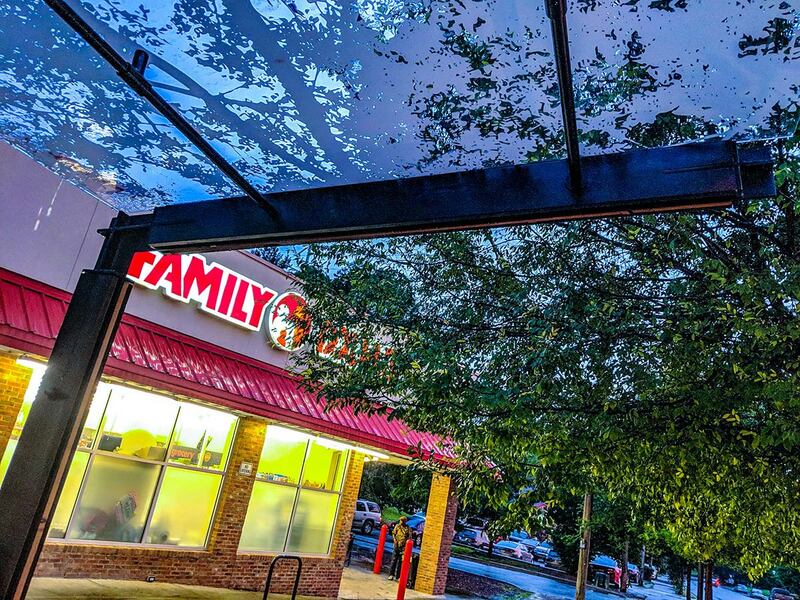 Each bay is connected by steel tube standoffs, while the polycarbonate roof and back panels act a shear wall and provide shelter under a printed abstraction of the oak tree canopy that is so prevalent in Cascade Heights. 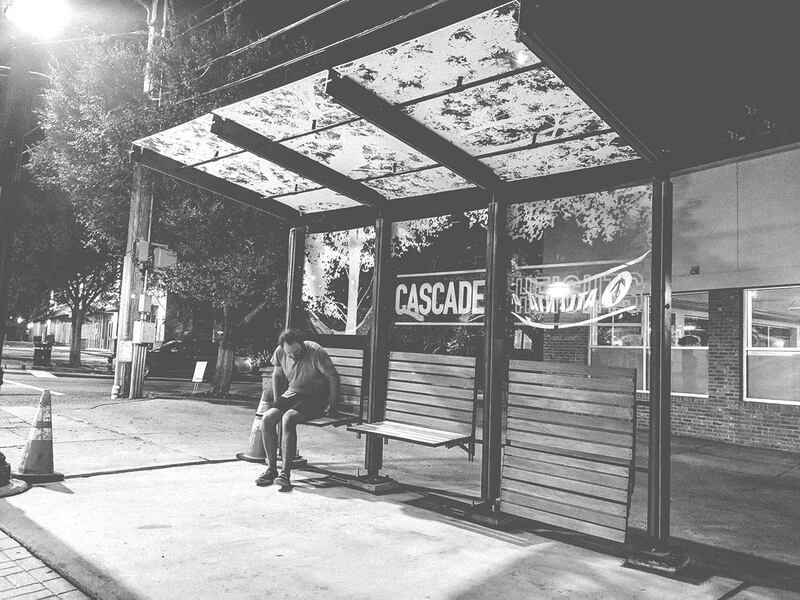 The back panels extend the canopy abstraction while communicating the Cascade Heights name. Custom fold-up benches surfaced with poplar boards were installed as requested by the city. 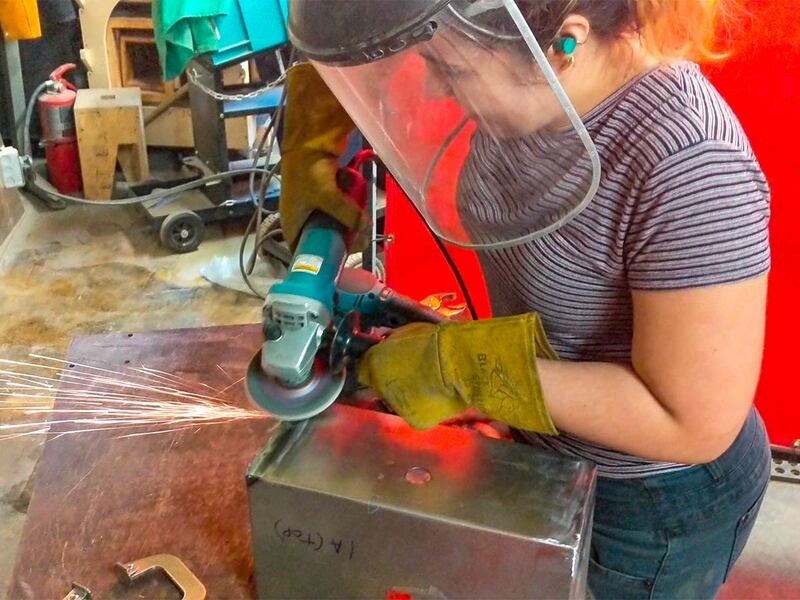 Structural steel was fabricated by Vass Metal Works, while all other contract work was completed in-house at MASS Collective's makerspace. 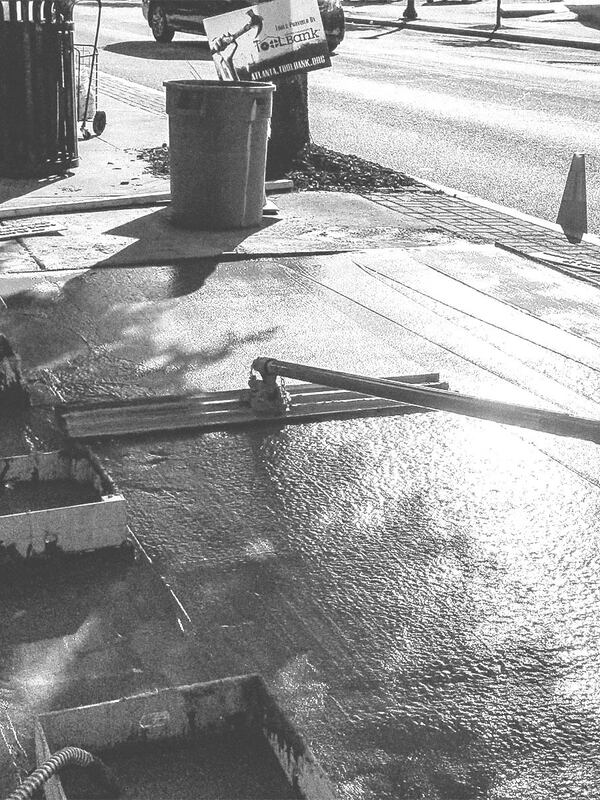 This included concrete work, bench woodworking and welding its steel framework, custom printing the polycarbonate roof panels with ARC, and installation. 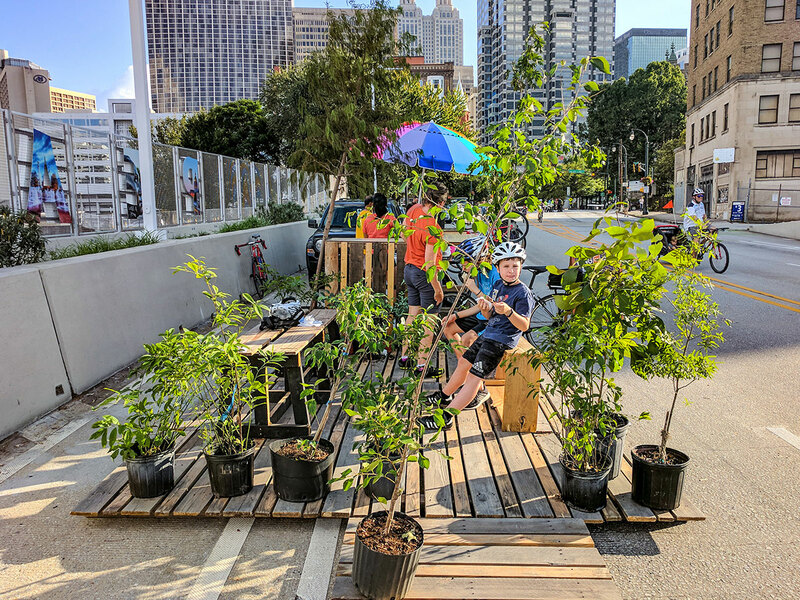 It should be noted that the Office of Mobility Planning decided to exclude the final fold-up benches due to concerns of liability with the bench mechanism. All follow up work with the project, including the purchase and installation of planters and a static bench, was completed by the city. Personally identifiable information, such as your name, address, email address, and telephone number, and demographic information, such as your age, gender, neighborhood, and interests, that you voluntarily give to us when you choose to participate in various activities related to the Site, such as donation contributions, registration to volunteer, and message boards. You are under no obligation to provide us with personal information of any kind, however your refusal to do so many prevent you from using certain features of the Site. Fulfill and manage purchases, subscriptions, donations, orders, payments, exchanges, returns, and other transactions related to the Site. Solicit support for the Site and our charitable mission. If we believe the release of information about you is necessary to response to legal process, to investigate or remedy potential violations of our policies, or to protect the rights, property, and safety of others, we may share your information as permitted or required by any applicable law, rule, or regulation. This includes exchanging information with other entities for fraud protection and credit risk reduction. If you interact with other users of the Site, such as our blog / news update page, those users may see your name, profile photo, and descriptions of your activity, including sending invitations to other users, chatting with other users, liking posts, or following blogs. We may share your information with advertisers and benefactors for the purpose of conducting general business analysis. We may also share your information with such third parties for marketing purposes, as permitted by law. We may also partner with selected third-party vendors, such as Google Analytics, to allow tracking technologies and remarketing services on the Site through the use of first party cookies and third-party cookies, to, among other things, analyze and track users’ use of the Site, determine the popularity of certain content and better understand online activity. By accessing the Site, you consent to the collection and use of your information by third-party vendors. We do not transfer personal information to these third-party vendors. However, if you do not want any information to be collected and used by tracking technologies, you can visit the third-party vendor or Network Advertising Initiative Opt-Out Tool or Digital Advertising Alliance Opt-Out Tool. You should be aware that getting a new computer, installing a new browser, upgrading an existing browser, or erasing or otherwise altering your browser’s cookies files may also clear certain out-out cookies, plug-ins or settings. We do not knowingly solicit information from or market to children under the age of 13. If you become aware of any data we have collected from children under age 13, please contact us using the contact information below. California Civil Code Section 1798.83, also known as the “Shine The Light” Law, permits our users who are California residents to request and obtain from us, once a year and free of charge, information about categories of personal information (if any) we disclosed to third parties for direct marketing purposes and the names and addresses of all third parties with which we shared personal information in the immediately preceding calendar year. If you are a California resident and would like to make a such a request, please submit your request in writing to us using the contact information provided below. If you are under 18 years of age, reside in California, and have a registered account with the Site, you have the right to request removal of unwanted data that you publicly post on the Site. To request removal of such data, please contact us using the contact information below, and include the email address associated with your account and a statement that you reside in California. We will make sure the data is not publicly displayed on the Site, but please be aware that the data may not be completely or comprehensively removed from our systems. Most browsers accept cookies by default. However, you can remove or reject cookies in your browser’s settings. Please be aware that such action could affect the availability and functionality of the Site. If the Parties are unable to resolve a Dispute through informal negotiations, the Dispute (except those Disputes expressly excluded below) will be finally and exclusively resolved by binding arbitration. YOU UNDERSTAND THAT WITHOUT THIS PROVISION, YOU WOULD HAVE THE RIGHT TO SUE IN COURT AND HAVE A JURY TRIAL. The arbitration shall be commenced and conducted under the Commercial Arbitration Rules of the American Arbitration Association ("AAA") and, where appropriate, the AAA’s Supplementary Procedures for Consumer Related Disputes ("AAA Consumer Rules"), both of which are available at the AAA website www.adr.org. Your arbitration fees and your share of arbitrator compensation shall be governed by the AAA Consumer Rules and, where appropriate, limited by the AAA Consumer Rules. The arbitration may be conducted in person, through the submission of documents, by phone, or online. The arbitrator will make a decision in writing, but need not provide a statement of reasons unless requested by either Party. The arbitrator must follow applicable law, and any award may be challenged if the arbitrator fails to do so. Except where otherwise required by the applicable AAA rules or applicable law, the arbitration will take place in Fulton County, GA. Except as otherwise provided herein, the Parties may litigate in court to compel arbitration, stay proceedings pending arbitration, or to confirm, modify, vacate, or enter judgment on the award entered by the arbitrator. IN NO EVENT WILL WE OR OUR DIRECTORS, EMPLOYEES, OR AGENTS BE LIABLE TO YOU OR ANY THIRD PARTY FOR ANY DIRECT, INDIRECT, CONSEQUENTIAL, EXEMPLARY, INCIDENTAL, SPECIAL, OR PUNITIVE DAMAGES, INCLUDING LOST PROFIT, LOST REVENUE, LOSS OF DATA, OR OTHER DAMAGES ARISING FROM YOUR USE OF THE SITE, EVEN IF WE HAVE BEEN ADVISED OF THE POSSIBILITY OF SUCH DAMAGES. NOTWITHSTANDING ANYTHING TO THE CONTRARY CONTAINED HEREIN, OUR LIABILITY TO YOU FOR ANY CAUSE WHATSOEVER AND REGARDLESS OF THE FORM OF THE ACTION, WILL AT ALL TIMES BE LIMITED TO WHAT IS PERMISSIBLE BY APPLICABLE LAW. CERTAIN STATE LAWS DO NOT ALLOW LIMITATIONS ON IMPLIED WARRANTIES OR THE EXCLUSION OR LIMITATION OF CERTAIN DAMAGES. IF THESE LAWS APPLY TO YOU, SOME OR ALL OF THE ABOVE DISCLAIMERS OR LIMITATIONS MAY NOT APPLY TO YOU, AND YOU MAY HAVE ADDITIONAL RIGHTS.